A few of the 59 riders at the start. 59 riders lined up at the Super 8 in Lumberton for another fun-filled set of brevets. 200K, 300K, 400K, and 600K riders all started at once and I became part of the large front group that formed. The speed was really picking up, but I was feeling good and took a couple of my trademark short-pulls on the front. About 20 miles in we made a right turn onto Gum Spring Rd. and found road construction barriers blocking the route! No worries, we could see the barriers on the other side of the torn up road, so we all did a short cyclocross impression. That caused a bit of a split in the pack, but it mostly got back together until Ammon, where the 200K and 300K riders had a control stop while the rest of us rolled on. I took another pull up front, and my plan was to pull for 1 mile, then get my point & shoot camera out to do another video as I fell back to the comfort of the draft. I was still at 0.8 miles and down in my aerodynamic tuck when I had to dodge left to avoid a hole. I was moving back to the right, but the rider behind me had jumped into the gap and was accelerating, so my pull was over! I sat up and tried to get my camera out quickly. Well, I screwed up and fumbled the camera and it went skittering down the road at 18-20mph! I pulled off to the left and turned around to see the last folks in line dodging my camera as it lay on its back in the middle of the road. After recovering it I just stashed it in the bag and got to work catching back on. At the first control in Roseboro there was the usual race to be first in line to get the card signed and the line for the restroom. I've become more efficient at the controls, so I was able to get my checklist done and still have a minute to check out the damage to my camera. It's mostly cosmetic, but the corner by the battery door has a big gash and the camera won't turn on. I opened the battery compartment and little bits of broken plastic fell out. The shock had broken the plastic catch that holds the battery in place. I grabbed a bit of discarded cue sheet, folded it up to about the right size and wedged it in place. The camera worked! Still, I didn't take it out for the rest of the ride. Folks started leaving the control so I got back on the bike and headed out. As always the stop caused splits in the pack, and I was now in the 2nd group on the road. We were trucking along at a good pace though, and it seemed like we were slowly closing the gap to the smaller front group. My turn to pull came up and I put my head down and pushed about 21-22mph. Guess that wasn't enough because Tom F. came flying by me and I had to decide whether to go or not. There wasn't anybody on his wheel, so I pushed even harder and got on his wheel. In my mirror it looked like most of the group had stayed with me and I held Tom's wheel until we were almost up to the front group, then waved the next rider forward and dropped off. By the time I was tucked in at the back we had bridged the gap and it slowed down. I found Colonel Mike near the back of the group and he told me that effort had really taken it's toll on him. Next we had to cross some intersections in Garland, causing splits and accelerations again. Some of these intersections got a bit hairy, with oncoming traffic and cyclists wanting to get through and not get dropped. After one particular intersection I decided to remove myself from the rat race- I was burning too many matches too early and I saw that Col. Mike had already pulled the plug and was a bit further back. I sat up and started spinning an easy gear, plugged in my iPod and just cruised along waiting for Mike to catch up. I hit the lap button on my Garmin so I'd have a record of this first section with the group- it gave me a 19.4mph average speed for this first 60 miles. Once Mike caught me we continued a nice easy pace for awhile, knowing that Jerry, Wes, Tim, John, and other strong riders were still behind us and we might have some company soon. Jerry and Wes were the first to catch us, and we picked it up a bit and rode with them for a few miles, but it was getting to be too much for Mike again. When I saw him pull the plug I dropped off and let Jerry and Wes go up the road. It looked like Mike was hurting, and I've been there & done that. In a couple more miles he asked if we could stop for a minute. He was having some weird high heart rate issues and was worried that if he felt like this after the first 100K perhaps 600K was biting off a bit more than he could chew. He had just recovered from a respiratory infection, so I can understand why he'd be worried. I helped him weigh his options: turning back meant riding 65 miles back to Lumberton... with 4 routes running at the same time who knows how long it might take Tony to get out there if Mike waited for a pick-up... and the next control was 42 miles up the road. We checked the open/close times on the card- it was about 11:20am and we had until 7:02pm to ride the next 42 miles, plenty of time. We knew that there was food in Wallace just 20 miles away, so we decided to just casually spin up the road and get some lunch. Being from DC, Mike had never heard of Andy's before (like a couple of Seattle randos who rode this route with us in February) so I thought it was a good idea to introduce him to it. After we ordered burgers and chocolate shakes Tim and John showed up. We had a much needed meal and Col. Mike was looking much, much better. Back on the road with Mike, Tim, and John and we were making good time. It was a short 20ish mile run to the control in Maple Hill, then another short run of 24 miles to the control at Rocky Point. By this time it was 5pm and we knew that it would get dark before our next control stop in Garland, 54 miles away. 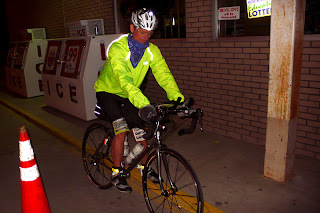 We donned our reflective gear and got back on the road. The 4 of us were working well together despite the headwinds we'd been fighting all day. John and Tim were taking their usual long pulls, Mike was looking strong again, and I was holding my own... at first. After awhile it was my turn to run into problems. I couldn't catch my breath and every time I tried to take a deep breath I would cough. I'd had this same symptom once before- on the NCBC 400K brevet back in May 2010. That turned out to be pine pollen. I guess spring has officially sprung! This coughing, hard to breathe stuff slowed me down, but my companions were nice enough to wait up for me any time I fell behind. We rolled into Garland at almost 9pm and just barely caught the pizza place before it closed. Food definitely helps. It had cooled down dramatically so I put on my knee warmers and my wind vest. Apparently John hadn't brought knee warmers, so a bit further down the road he improvised with a couple of free newspapers and some plastic bags. John O. gets the Rando Creativity Award for his newspaper leg warmers and plastic baggie mitts. My breathing issue got better- good thing because we had about 70 miles to go to get to Shallotte and then 12 more to get to Sunset Beach where we could finally catch some sleep. The other guys had been knocking back Red Bulls and NoS energy drinks (135mg of caffeine in those!) but I was afraid I'd crash hard before we got to the beach. Maybe I should've had one though, because around 1 or 2am I started getting bleary-eyed. My speed was suffering again, and every time I tried to calculate speed / distance left to go to Shallotte it seemed like I wasn't getting any closer. I tried to get the guys to go on ahead since I was slowing them down, but they wouldn't leave me. For a little while I got on the front and sped up the pace and made some time, but eventually I didn't feel safe going 15 or 16mph so I had to slow it down. I'd whipped up John and Tim though, and they were off. A couple of times I had to ask Mike not to ride beside me because I was getting swervy and dangerous. He was worried about me, and wasn't going to leave me behind no matter what. Thanks Mike! Eventually we made it to Shallotte, sometime around 3:30 or 4am. I'm not really sure of the time. Tim and John were waiting for us, but I told them I was going to lay my head down at one of the tables in the convenience store so they took off while Mike stayed with me. I felt like I didn't ever fall asleep, so I got a cup of coffee and a snack so we could get back on the road. Later Mike told me we had been at the store for about an hour! Maybe I did get a nap after all. As we were getting ready to leave, in rolled Ricochet Robert. He did a short stop and joined us for the short 12 mile run into Sunset Beach. The coffee or the nap or the Little Debbie iced honey bun really worked, because we kept up a nice pace into Sunset Beach, climbed the bridge, and arrived at 5:20am. We were confused about where the hotel was, it looked like the cue sheet told us to go back over the bridge and then the hotel would be on the right. We climbed the bridge an extra time before we noticed that the hotel was only 0.1 miles from the pier, so it was back over the bridge to go get some sleep. A hot shower after over 400K is a great thing. As soon as my head hit the pillow I was out, and I slept hard until my alarm went of at 9am. Mike was getting ready to go, so I put on a fresh kit and got something to eat so we could get back on the road. Sleep was what I needed, now I felt great. Mike said that we were the last riders out on the 600K route. Ricochet Robert had left earlier with another rider and 2 others had left just before us. We decided that would be good motivation- 4 carrots up the road! I found out later that Tim and John had only slept for a couple of hours, then got up and rode on with Jerry and Wes. Mike and I cranked up the pace and soon we passed a store with 2 bikes parked in front. Only 2 more carrots. At the South Carolina line we stopped at a convenience store and found we had caught Robert and his companion. We grabbed drinks and snacks for the next 25 mile run into Boardman. At the control in Boardman I went looking for food. Last time I was at this convenience store I had one of the triangle sandwiches, and it caused major gastric distress about 10 miles up the road. This time I had one of the spinning hot dogs- Joe from Seattle ate one of those last time and it didn't send him running for the woods. We got back on the road, with only 18 miles to the next control at Clarkton. I was spending most of my time up front, getting into the zone and keeping my cadence rhythm going I could comfortably maintain about 16-17mph. Just outside of Clarkton we slowed it down a bit, this time it was Col. Mike's turn to feel bad. He waited until this last control to tell me that he really hadn't slept at Sunset Beach, just laid in bed. It must have been all that NoS energy drink he had! He ate a couple of spinning hot dogs and we had a nice long stop and a chat with one of the locals. I really enjoy these little encounters on the road, they inevitably start with the question "how far you ridin?" and then you get to see the look on their faces when you answer "380 miles." This gentleman took a keen interest in my bike, my Brooks saddle, and how my clipless pedals worked. It gave Mike plenty of time to eat his hot dogs. Gorgeous sky with "God light" on Sunday. It's 28 miles from Clarkton back to Lumberton. Last time I rode it was in the dark at the end of the 400K with Mike, Tim, and Geof. We passed the singlewide trailer with all the pit bulls in cages outside on NC-211- that's where the drunk rednecks had yelled and chased us on the 400K. They weren't out in the yard this time, must have gone fishing or something. It was looking like we'd arrive around 7 or 7:30 at the pace we had been going, but the spinning hot dogs worked their magic and Mike was feeling better. We kept up a good pace, and the frequent dog chases probably saved us 15 or 20 minutes! We arrived at the finish in Lumberton at 6:30 for a total time of 35 hours. Tony had pizza and sandwiches waiting, so I ate something before getting in the car for my drive home. 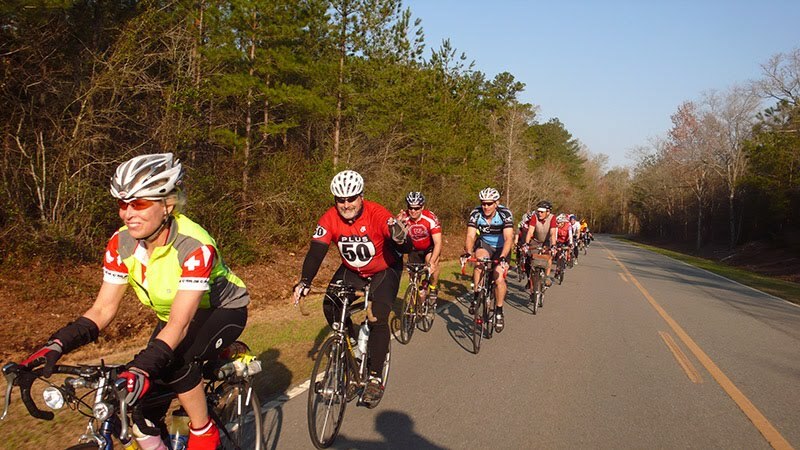 Another great Bicycle for Life brevet! Thanks Tony!! Me & Col. Mike still smilin' at the finish! And ... you've made it OFFICIAL ... "Ricochet Robert"!! !